THE SORROWS is Jonathan Janz’s debut novel. It’s a helluva way to start a writing career. 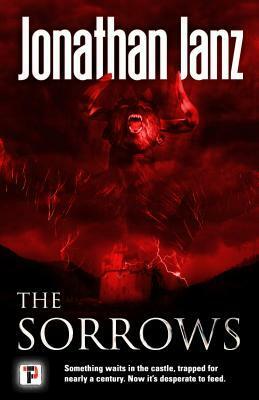 Flame Tree Press is set to re-release THE SORROWS on December 1st. You’ll want to grab a copy of this one. THE SORROWS doesn’t read like a typical debut. The entire book is strong; there are no weaknesses. Jonathan Janz’s delivery is spot on. The foreboding is incredible. There is so much to love about THE SORROWS. Most authors try to find their voice with their first book, but Janz figured it out on his first try. Janz’s unique style is on full display in THE SORROWS. Ben Shadeland and Eddie Blaze are the hottest young music composers in Hollywood. They are coming off an Oscar nomination and they’ve been selected to score a big-budget horror film for Lee Stanley, the most prominent director in film. Ben’s been put through the wringer and his music has suffered. Eddie knows just the place to get Ben’s creative juices flowing once again. Chris Blackwood is the heir to Blackwood estate and he needs money, so he lets Ben, Eddie, Claire Harden (an inspiring composer), and Eva Rosales (Lee Stanley’s gorgeous assistant) stay a month in Castle Blackwood. Castle Blackwood is located on the Sorrows, an island off the coast of northern California. The island and its castle have been uninhabited since a series of gruesome, unexplained murders in 1925. Are you game yet? Jonathan Janz doesn’t use the tired, old haunted house tropes as a crutch. THE SORROWS transcends the haunted house genre. On one hand, there’s the haunted castle, and on the other, there are haunted people. How cool is that? Janz turns it up a notch. The scenes are arresting and vivid. You can’t unsee them. Some of the scenes will make you shake and shiver. There is one scene that I had to stop reading and close the book because it completely unnerved me. I finished reading the scene the following morning. The way Janz intertwines the history of the castle with the present is stunning. I also like how he builds his characters–he does it with a swiftness. The dialogue is spot on. The story flows well and it is layered perfectly. THE SORROWS is like a chocolate layered cake; it’s so delicious you’ll want to devour it in one sitting. From start to finish, THE SORROWS is engrossing. THE SORROWS You won’t see any of it coming. Janz knocks this one out of the park. If you dig THE HOUSE ON HAUNTED HILL or HELL HOUSE, then THE SORROWS is the book for you. I still can’t believe this is Janz’s debut. THE SORROWS reads like a seasoned pro wrote it. I can’t wait for the rest of Janz’s backlist to drop next year at Flame Tree Press. Give ’em to me now, please.